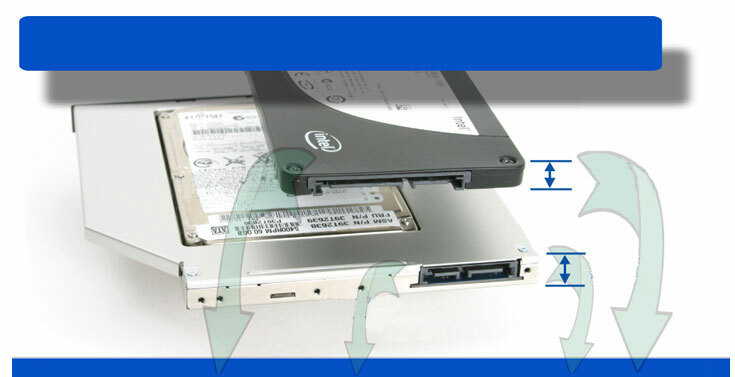 Add a second Hard Drive or SSD to your laptop using the laptop's CD / DVD optical drive bay ! There are just a few notebook models out there that are prepared for a second hard drive by the manufacturer, but using our OptiBayHD caddys, almost any notebook, laptop and even Macbooks will accept a second HD or SDD instead of the optical CD, DVD or Bluray drive. The optical drive is easy to remove. Most often there is just a single screw at the bottom of your notebook that needs to be removed to slide out the CD, DVD or Bluray drive. Than slide in the OptiBayHD caddy with your choice of high capacity HD or a fast SSD and use this new drive together with your first harddrive installed. NEW: Use our OptiBayHD Universal Caddys for an easy selection. A second hard drive or a super fast SSD offers the capacity and speed you need, but makes even more sense if you separate the operating system from valuable data or if you use parts of the second HD as a backup drive for frequent security backups. You can use several OptiBayHD caddys for your coworkers or different projects or separate private and business data using the same notebook. OptiBayHD caddys can be used outside of your notebook as well using a special USB or eSATA cable that connects to the OptiBayHD external connector and a USB port or eSATA port of your notebook or PC. 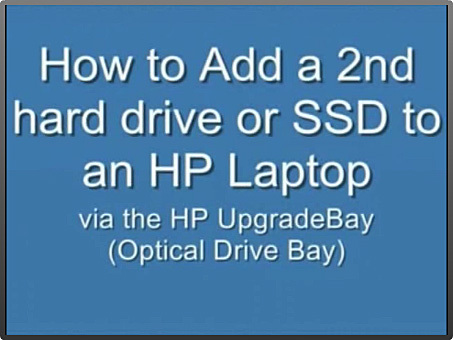 This way you could use even more drives with your notebook at the same time or connect the removed optical CD, DVD or BD drive to your notebook the same way. The OptiBayHD caddys fits almost any Notebook with a CD, DVD or Bluray drive. The OptiBayHD Universal Caddys offers several options regarding the fron bezel. A black standard front bezel is included, but can be changed against the original front bezel from the optivcal drive that has been removed from the notebook. The Universal Caddys can be used without any front bezel as well for notebooks that used Slot-In CD /DVD drives. The original bezels can be removed easily from the optical drives. This is why the universal Caddys relaces the OptiBayHD caddys with black bezels or no front bezels (order numbers with -B or -NF at the end) as long as the height and connectors are the same. The SATA to USB or eSATA adapter cable is the easiest way to use the removed optical CD, DVD or Bluray drive or another OptiBayHD caddy on any USB or eSATA port from notebooks or PCs. The optical drive or the OptBayHD caddy can be used external in addition to the notebooks or PCs internal drives. This helps to copy large files fast or to use CD, DVD or Bluray media together with your notebook even if you removed the optical drive from your notebook. We added a list with some popular notebook models and the OptiBayHD caddy order numbers that fits the noteboks optical drive bay. There are some special notebook drive caddys available as well for some notebooks, that offers a second drive bay for another HDD or SDD. 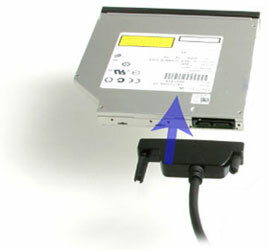 Please understand that we cannot check out all notebooks so if your model is not listed, remove your optical drive first and use the table above to choose the right OptiBayHD caddy comparing the external connector and checking the height of the optical drive removed.